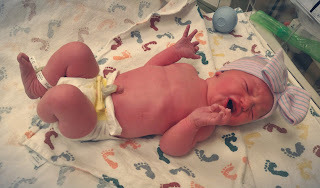 My daughter, Laura had a daughter yesterday. Mom and newborn are doing well. The only reason Tabatha is crying is because someone put that silly hat on her. I do not do politics but the current state of affairs makes it hard not to comment. I have a simple, genius idea to balance the Canadian budget and help benefit those least able to afford tax. Raise HST/GST by 3% then pay all Canadians who make less than $35K 3%. Anyone making $35K cannot spend more than 3% on HST since many things are not taxable sothey would be better off. Balances the budget. Saves getting the Canadian system too far out of sync with the US. Saves Canada from increasing tax complexity. I am worried the current track will create lots of work for accounting firms on how to work around paying 73% tax so in the end, the government will not get the 73% anyways. Sorry to the accountants out there. Not so clear on that Jim, but I expect in the interests of brevity you had to compress your explanation. Those under $35K you pay them 3% of what? I would suggest the long held theory of a flat tax for all income levels would be a much simpler way to go and could quite easily address the budget woes of Ottawa. The biggest problem we have though is the tax and spend mentality of current governments. Flippant remarks such as the "deficit will take care of itself" and the lack of a clear plan, by Ottawa, on when the budget will be balanced is indicative of future tax increases that will detrimentally impact everyone. I *LOVE* the tax idea. A consumption tax is much more effective at ensuring the right people are paying it, and frankly - providing some relief to those under $35K brings the right balance. 3% of income was my idea. Since HST goes up 3%, the most anyone making under $35K will be spending is their income so 3% of that.